Upright monuments are what most people think of when they envision a memorial. These above ground monuments have been referred to as “gravestones”, “headstones” or the antiquated “tombstones” and were previously made of limestone, marble or sandstone. Learn more. 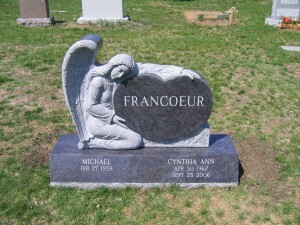 A slant memorial is a smaller above ground monument with a slanted front and can be installed with or without a base. Learn more. Markers, also known as “grass markers” or “footstones”, are placed flush in the ground. The standard size is 2’ x 1’ x 4” and are generally used to mark a single grave. Learn more. 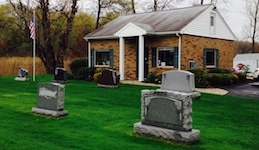 Granite benches can be installed in cemeteries to memorialize a loved one, depending upon cemetery regulations. Other uses for benches include residential gardens, entrances/foyers for businesses or to recognize and commemorate people, events or organizations. Learn more. Pets markers are available to memorialize our beloved pets. Pet markers come in many shapes and sizes and can be personalized with etching and photos. Learn more.